Review: Cristian Mungiu’s new feature film is a tale of obsessive love and religious mysticism. Voichita and Alina were best friends but eventually their lives went separate ways. The former sought refuge in an Orthodox convent, while the latter went to Germany to work in a bar. Years later, in Romania, they will realize that their relationship was not as before. Jealousy, faith and exorcism, are hot topics depicted here. 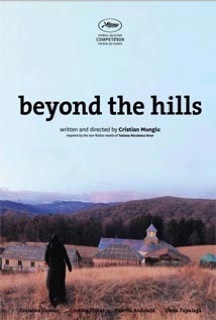 “Beyond The Hills” is absorbing, evincing a grey temper that reminded me Bruno Dumont’s approach in “Hors Satan”, yet without being so aggressive. Skillfully framed, Mungiu showed to be consistent with a steady or moving camera, as the case demanded. The absence of music was not surprising, in a movie that doesn’t attain the immediate fascination of “4 Months, 3 Weeks and 2 Days”, yet still shows a powerful determination and credible performances during its 150 minutes.